This ImmunoStrip® test is a rapid and reliable tool for detection of Acidovorax avenae subsp. citrulli (Aac), the causal agent of bacterial fruit blotch in watermelon, squash, pumpkins, and cantaloupe. 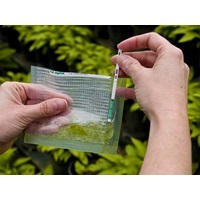 The assay can be used to test leaves, fruit, bacterial cultures, and seedlings exhibiting symptoms of Aac. This test does not require any special equipment or expertise to run. Results are obtained in as little as a few minutes.